Knowing how to succeed in the job interview is important to landing the career you want. It doesn't matter where you studied, which school or college you attended, how much experience you have, or whom you know in the industry--if you aren't able to answer interview questions and interview successfully, you won't get the job. Our job interview guide gives you information about how to conduct interviews successfully and covers most job interview techniques. It also covers what to avoid during interview. Learning the best interview skills is important for every individual. Unless your resume catches the interviewer's eye in 10 seconds it's over, you're done. So the big question is how do I catch the interviewer's eye? Here comes the best advice on how to get a job interview you'll ever get. Cater your resume to the job description!!! I can't stress this point enough. It's imperative that you cater your resume to each position you apply for. And I mean taking each line on the job description and writing a line on your resume to reflect your experience with regard to that line. Yes, it takes more time than sending the same resume to 100's of jobs, but you're far better off applying to a fraction of those jobs with a resume specifically written for each job. Put yourself in the interviewer's shoes. Their job is to hire the most qualified candidate. They've been given a set of qualifications to look for: aka the job description, and that's exactly what they're after, so give it to them! There is no excuse for it, none! You don't want a pissed off person interviewing you. Leave extra early, do whatever it takes. Blaming it on traffic or anything else doesn't matter (even if it's true). Google the company you're interviewing for. Learn as much as you can about the company's mission, objectives, goals, and future plans. If you're asked why you want to work for the company, you best answer something better then, "I like the company's location", which was said. Your interviewer(s) will likely have a copy of your resume but bring spares. It shows you're prepared and serious about getting the job. Very few people bring a notepad with them to a job interview. It's a very subtle thing that makes you stand out. Take notes when appropriate. Make sure you go into a job interview having showered and wearing clean clothes. If you like wearing cologne or perfume, don't wear any on the day of the interview. What's subtle smelling to you may be overwhelming to your interviewer. If you don't think interviewers Google you or look you up on Facebook or MySpace, you're crazy. Hiring managers I've talked to all do this, as one put it, "to weed out people who wouldn't be a good fit in the company's culture." Don't give them ammo to not like you, set your profiles to private. Too many people think they are funny when in reality they're not. 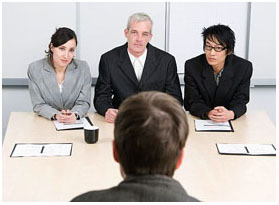 A job interview isn't the place to test your material. Be friendly and outgoing, save the jokes. When answering a question, answer the question. Don't start out answering a question and then veer off to talk about something else. Make sure your answer directly reflects the question being asked. Common sense but apparently needs to be stated. Interviews can be a nervous experience but rubbing your chin, twirling your hair, or anything else along those lines makes you look like you're lying or lacking confidence, both not good. Staring at the floor, ceiling, or wall when speaking or listening makes you appear disinterested. Again, simple and obvious but happens way more then you'd think. Maybe you don't have any idea where you want to be in a few years professionally but figure out something to say. If you don't and you're asked, you appear un-ambitious, which leads an interviewer to think you'd be a lazy employee. Be prepared to talk about something that you're proud of accomplishing, whether professionally or personally (or a failure and what you learned from it). Be able to express why you want to work in that field/industry and what you do to further your knowledge (books, blogs you read). The more intelligent or informed you are the more impressive you'll look. At the end of the job interview make sure you have some questions to ask. If the interviewer doesn't offer you a chance, ask to ask. Again, it reinforces your strong interest in the job. It's easy to send an email but take the extra effort to mail your interviewer a hand written thank you note. It reinforces your interest in the job. It doesn't need to be long, just make it sincere. There you have it. The best job interview tips you'll ever get. Stick to them and you'll be on your way to getting hired! 17. By practicing your responses to some of these questions, hopefully you will not be taken off guard if asked one of them. Most importantly, relax, go with the flow, and before you know it, you'll be in your next job. Do you have any question for me? (See Questions for the Interviewer that you might want to ask below).